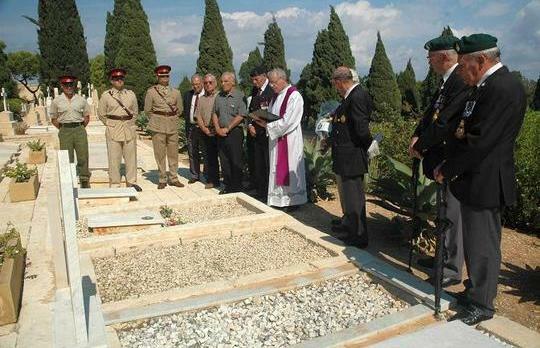 Serving and retired officers and men of the AFM have held a memorial service to commemorate 17 Maltese soldiers who died in a crash in the Libyan desert in 1961, the biggest single loss of Maltese men in uniform in peace time. The commemoration was held at Pembroke Military Cemetery, where many of the soldiers are buried. Those present included survivors, former colleagues and relatives of the victims, as well as various representatives of the AFM and British ex-servicemen associations. The ceremony recalled the evening, of Tuesday, October 10, 1961, when a Royal Air Force Hastings aircraft crashed on take-off at the El Adem Air Force base in Libya, killing and injuring men of the Malta Fortress Squadron, Royal Engineers. The Maltese sappers were working with 5001 Squadron. A further 22 survived. Their bodies were flown back to Malta for burial, and the funeral for most of them took place on Friday October 13. Others died on their injuries a few days later. Picture by: Alfred Azzopardi/AFM Press Office.